I love posh soft drinks, and we've had some fab apple related ones - it really is the grape of the non-alcoholic world. 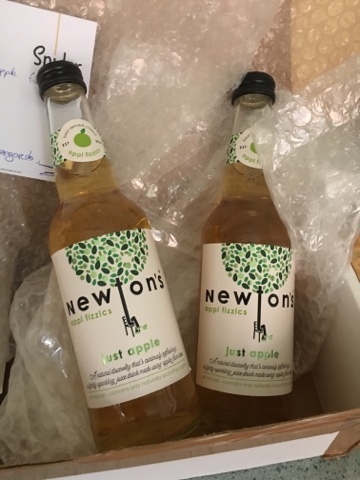 Here we have Newtons Appl Fizzics, which gets bonus points for using a cool name and idea (even though the actual science in the PR was a bit off). This is a cool and refreshing Apple drink that is fairly close to Apple Tizer and Tango and really far from the cider style ones. It's a little underwhelming compared to the stronger side of this area. The taste is refreshing and light and crisp but doesn't inspire me enough to chase down more bottles. It's really not that different to the can based apple drinks I grew up on. It's something I'm happy to finish and could see myself drinking again, but if the option for the innocent Apple or the red deluxe ones were there I wouldn't look twice.